we wanted to stub database access. So what actually is the problem? Let us assume that we want our autowired PlayerWebServiceImpl to be a Spy that we can verify. What is more you don't want to actually change anything in the applicationContext.xml - you want to use the current version of the Spring context. What about the Spy? It's more problematic since in order to create a Spy you need an already existing object of the given type. 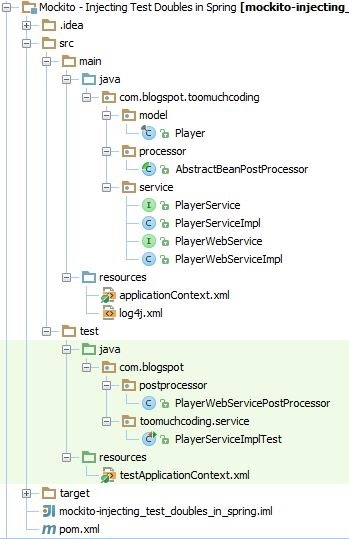 In our example we have some autowiring going on so we would have to first create a spring bean of the PlayerWebService type (Spring would have to wire all its dependencies) and then wrap it around with Mockito.spy(...) and only then would it have to be wired somewhere else... It's getting very complicatied doesn't it? You can see that the problem is not that trivial to be solved. An easy way to fix it however is to use native Spring mechanisms - BeanPostProcessors. You can check my article about how to create a Spring BeanPostProcessor for a specified type - we'll be using it in this example. In this test we want to mock retrieval of Player from the PlayerWebService (let's assume that normally it would try to send a request to the outside world - and we wouldn't want that to happen in our scenario) and test that our PlayerService returns the Player that we provided in the method stub and what is more we want to perform verification on the Spy that the method getWebServiceName() has been executed and that it has a very precisely defined return value. In other words we wanted to stub the method getPlayerByName(...) and wanted to perform verification of the spy by checking the getWebServiceName()method. The class is extending the AbstractBeanPostProcessor that implements the BeanPostProcessor interface. The logic behind this class is to register the Class for which one wants to perform some actions either before initialization (postProcessBeforeInitialization) or after initialization of the bean (postProcessAfterInitialization). The AbstractBeanPostProcessor is well explained in my post Spring BeanPostProcessor for a specified type but there is one slight change - in my old post we were allowed by the abstraction to perform some actions on the bean without the possibility of returning a wrapper or a proxy on the bean. As you can see in the case of PlayerWebServicePostProcessor before initialization we are creating a Spy using Mockito.spy(...) method. In this way we create a factory hook on the intialization of beans of given type - it's as simple as that. 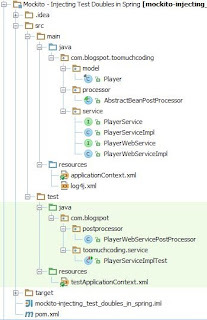 This method will be executed for all the classes that implement the PlayerWebService interface. While checking out current solutions to this problem I have encountered the Springockito library by Jakub Janczak. I haven't been using this so I don't know what are (if there are any ;) ) production issues related to this library but it seems really nice and intuitive - great job Jakub! Still, you become dependent on the external library whereas in this example I've shown how to deal with the issue using Spring. you have to be familliar with internal Spring architecture (that it uses BeanPostProcessors) - but is it a disadvantage? ;) - in fact if you use the AbstractBeanPostProcessor you don't have to be familliar with it - you just have to provide the class type and actions to happen before and after initialization. The sources are available at TooMuchCoding BitBucket repository and TooMuchCoding Github repository.